Yes, that mysterious poi thing is one of them. Think about all the purple foods you know. Not too many come to mind, right? You could probably sum them up on five fingers or less. 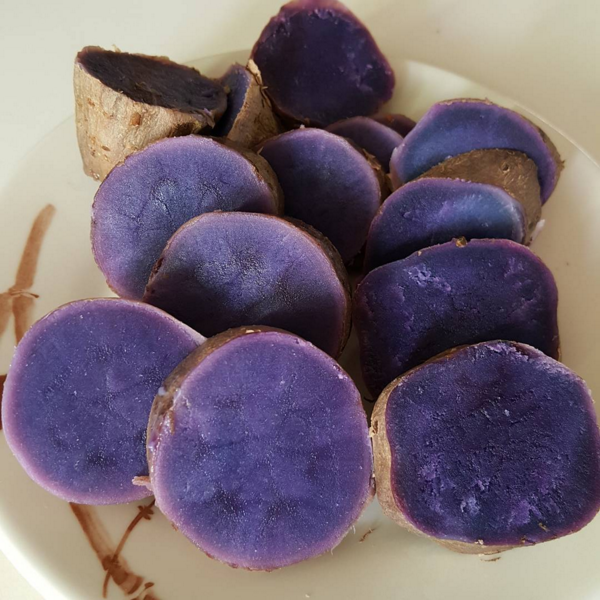 But thanks to a variety of cultures that make up our population, Hawaiʻi is blessed with many distinctive purple foods. You’ll see them everywhere throughout the islands, like on desserts, snacks, or side dishes on plate lunches. Whether brought in from another country, or cultivated locally, these seven purple foods epitomize the flavors of Hawaiʻi. When you talk to a person from Hawaiʻi and you bring up the subject of sweet potato, chances are they aren’t thinking about those orange sweet potatoes that are popularly candied for the holidays or made into sweet potato fries. 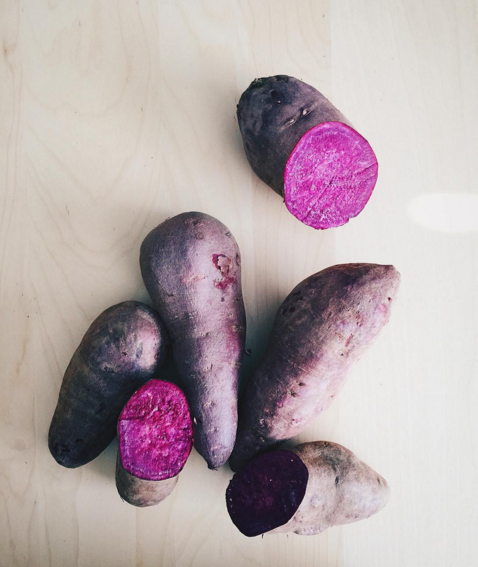 Instead, people born in Hawaiʻi grow up eating the vibrant, purple Okinawan sweet potato. Although its origin is actually America, it has become a popular food in Japan and Hawaiʻi. It is mostly seen as a side dish on Hawaiian food plates, usually placed right next to a couple of slices of pineapple and the Hawaiian coconut gelatin dessert, haupia. 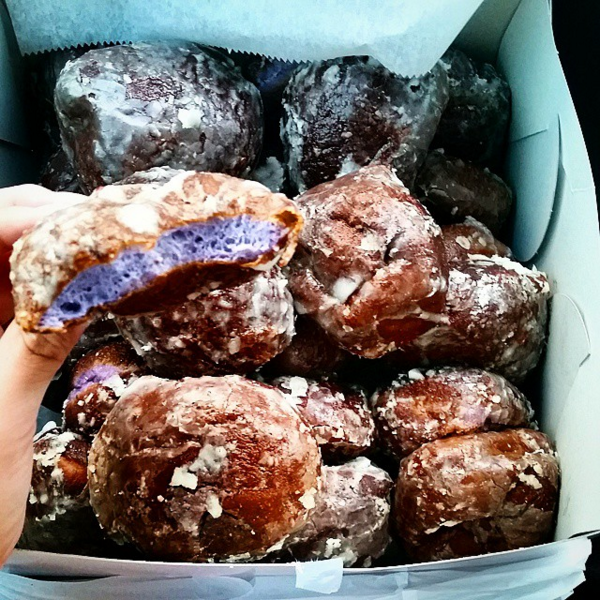 Ube, more commonly known as purple yam, is a food whose presence in the Hawaiʻi food scene stems from the Filipino dessert, ube halaya. Proving its versatility, ube is a popular ingredient for many desserts, ranging from pancakes to swiss rolls, or from ice cream to ube-filled sweet buns. If you’re in Hawaiʻi and down to try some bomb ube-flavored desserts, try the ube pancakes from Yogurstory or the ube gelato from Via Gelato Hawaii. Okay, so I may have cheated on this one. Azuki bean is technically a red bean that is used in Japanese, Korean, and Chinese cuisine, but by the looks of it, it seems pretty purple to me. 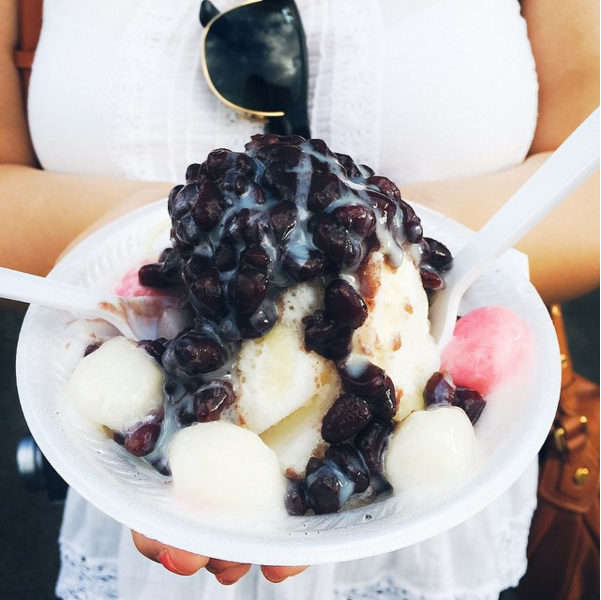 The most popular use of azuki bean in the islands is by placing it on top of a bowl of shave ice at Waiola Shave Ice. My personal favorite use of azuki bean is in the form of jin dui: a hollow fried pastry covered with sesame seeds and filled with azuki bean paste. You know it as that weird purple thing served at lūʻau. Local people, more prominently Native Hawaiians, know it as the most important staple of Hawaiian food. 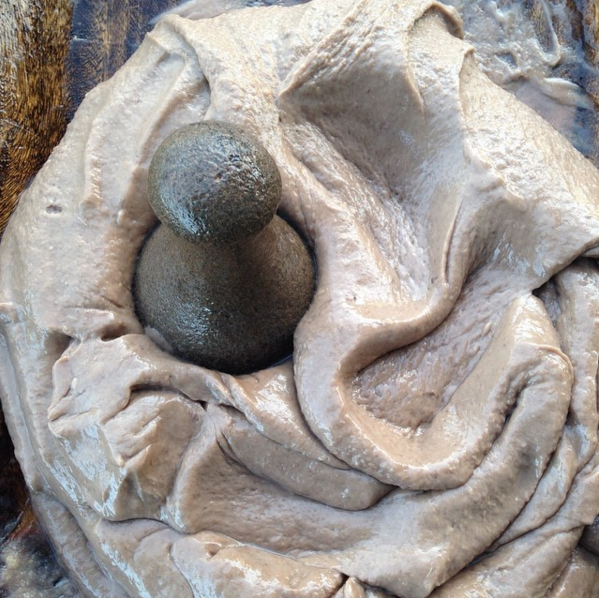 Poi is a mixture of kalo (taro) and water, pounded until it becomes a paste-like substance. In Hawaiian mythology, kalo is the original ancestor of the Hawaiian people, thus Hawaiians today stress the continual maintenance and the cultivation of the plant. If you’re still unsure about that odd taste and texture of poi, pair it with saltier Hawaiian foods such as lomi salmon, kalua pig, or the new food trend sweeping the nation, poke. With poi comes the beauty that is poi-flavored desserts. Some people argue that these poi “donuts” are actually more like the Portuguese dessert, malasadas. No matter what the label is, these glazed purple donuts are sure to satisfy your sweet-tooth. In Hawaiʻi, poi is commonly used as a baking additive to create a more moist dessert, and is especially popular in baking breads. Not to mention, it also adds that beautiful purple coloring. You can find these poi donuts at Kamehameha Bakery on Oʻahu. Although açaí is not native to Hawaiʻi, nor has any cultural significance in the islands, it is still one of the most sought-after treats after a trip to the beach or maybe just for a pick-me-up in the morning. 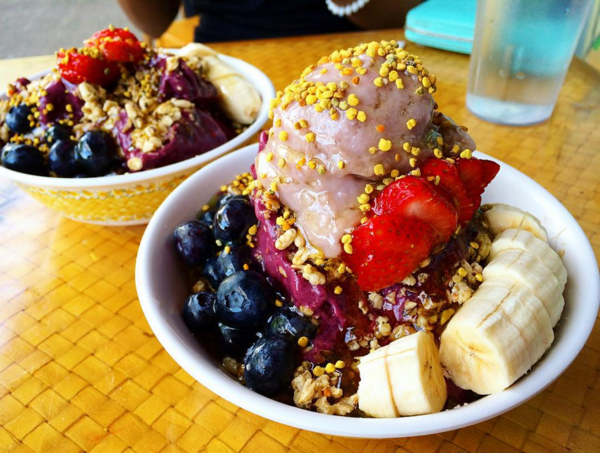 The açaí blend is usually topped off with slices of fresh fruits, granola, and honey. My favorite is The Hawaiian Bowl in the photo above at Diamond Head Cove Health Bar. In addition to strawberries, blueberries, bananas, granola, and honey, it is also topped with paʻiʻai – the water-less version of poi – and bee pollen. The poke you know that’s trending across the nation is usually ahi poke or salmon poke, which is cubed raw fish. 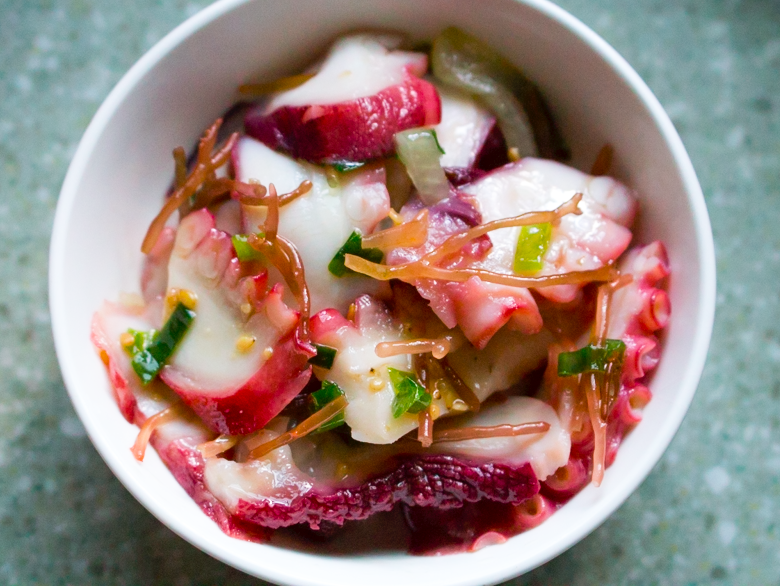 But this is tako poke, notably being seasoned tiny chunks of raw octopus. Tako is the Japanese word for octopus. The Hawaiian word for octopus is heʻe. Locals enjoy having their tako poke seasoned with limu, or seaweed, or to spice things up they mix it with the Korean side dish, kim chee.